Curtis Kulig's 'Love Me' message is reworked to help creatives network and land clients. Designing an effective business card is an artform in itself. You want to stand out and be noticed, but if you use too many gimmicks and hand over a business card fail, you'll end up being remembered for all the wrong reasons. If anyone knows how to create a winning business card, though, it's MOO. The business card specialist has an array of options on offer for people who want to get their name out there on little cardboard rectangles, and its latest offering uses the manifesto of a famous New York artist and illustrator. Found all over the world, featured on everything from sculptures to sneakers, 'Love Me' is the simple message of Curtis Kulig. And this instantly recognisable and memorable message is the perfect starting point for a business card pitch. 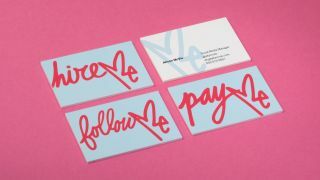 Taking the 'Love Me' message and making it a bit more professional, these business cards ask the recipient to 'Hire me', 'Follow me', and perhaps most importantly of all, 'Pay me'. Designed with bold colours that are sure to go noticed, these business cards are available to order now from MOO with prices starting at £13.19.